I wonder what a Festival like Byron’s does to the collective consciousness. We gathered for those three days – hundreds of us – bringing the best of ourselves to conversations, meetings and panels, down the road from the lighthouse at Australia’s eastern-most point. Another Finisterre – land’s end. Under open skies, our bodies unwinding in the warmth, we argued and posited and reflected. We listened to other ways of seeing and possible ways of being. We heard stories and songs. We looked at sculptures. We turned pages. We honoured the word. And then we left. Many of us, anyway. Where does all that go, that goodwill and possibility? I keep imagining the site, vibrating, highly charged, humming. I wonder, if I walked there now, would my feet feel the changes? Would I know that this was a place where people had tried to be at their best? And back home, how are we changed? How do we bring that spirit of openness and curiosity into our everyday worlds? Like this morning when someone sent me a link to a site because there was a complimentary review of my book. I scrolled down and of course I found another from someone who had hated it, who had not understood my intentions, who clearly loathed my writing. And what do I recall now? The negative response, of course! So all those voices of experience at Byron Bay, and all that generosity of spirit, didn’t prepare me for facing down my own ego and hubris, or my desire for the book to be liked. For me to be liked! It’s possible that it is partly because the book is written in the dreaded “I” voice, so it does seem that someone liking or disliking the book is commenting on me, the person; but in truth, I think it is something else. Post-Byron, after three days in a bubble of considered discussion and respectfully expressed differences of opinion, it has been a big transition back to the world of blunt opinions in which we mostly exist. Watching Q and A on the ABC last night, I was struck by the polarising, shouted, argumentative discourse. No-one was heard and nothing of value was said. Reading the daily papers, it’s rare to find an article critiquing a situation where the writer has first endeavoured to see clearly the position of the person being rebutted. I don’t know how commentators and public figures continue in this environment, but it must be bruising on some level. I was struck, at Byron, by how accessible and warm Bob Brown is. I was bowled over by the grace and generosity of Anna Rose. Both of them have suffered vicious personal attacks and received bags of hate-mail, yet both stay open and engaged; both step toward you with a smile and no caution. This seems to me a miracle, when their first response could be to withdraw and assume that the world is made up of people who will dismiss them or attack them on personal grounds. Forgive me if I seem to be drawing a long bow. I’m not for a moment comparing one person’s response to a book to the tsunami of hate Brown has weathered, or the battering taken by the elegant Anna. What I’m trying to do is to extend myself out from a personal response to something larger – something bigger than ego and pinpricks of pain. Because that is what Byron asked of all of us. That is what any gathering asks, when the parameters are respect, attention and dignity. We were invited to be the biggest versions of ourselves that we could be. From what I saw, that meant that all opinions, whether in rabid agreement or disagreement, were then able to be heard. Perhaps readers are more able to do that, but I don’t think so. We are all capable of it, all the time. And it doesn’t have to look like political correctness, or shutting down of discourse. It might just look like respect. So today I’m going to channel my Byron self, and try to listen harder, to take a breath before responding, and to let some things slide away if they are simply not helpful or comprehensible to me in the limitations of my mind. Luckily, there’s sunshine outside to remind me of Byron and its warmth. And there are the days to come. Hopefully. Because that is the other reminder that lodged firmly at Byron – the preciousness of these days, and how we can’t take a breath for granted. Gore Vidal died as I was travelling up there. Today I heard of the passing of Robert Hughes. Funeral parlours and crematoriums are always busy. Flesh dissolves into the earth or is burned to dust. Each breath I take is a victory and should be celebrated. I knew that when I saw a distant spume blurt from the ocean last Friday, just after hearing that a whale had died in Sydney Harbour. I think about that burst of water and air on the horizon now, and try to remind myself that each time I exhale, that is what I’m doing – pushing a celebratory plume into the air. And speaking of celebrating. Thank you to Jonathon Parsons for the festival and for programming us all so thoughtfully; to those with whom I was lucky to share panels – Jill Eddington, Anna Rose, Jessica Watson, John Bailey, Mike Ladd, Tony Taylor, Caroline Baum, Hannie Rayson and Charlotte Wood; to those who came to the workshop I taught; to those who spoke on the panels I watched (many of them my heroes), and to all of us who listened. 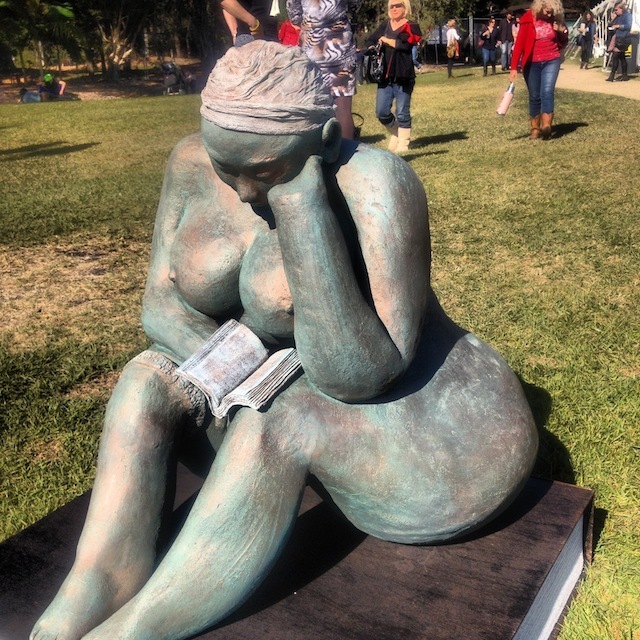 Here’s to all of us, readers on the grass. Gratitude too, to the Duchess of Malfi company, whose run in Sydney ended on Sunday. And to you for reading and subscribing here, beyond Byron. Please check the EVENTS AND MEDIA tab up above, or visit my Facebook page if you are inclined. This Thursday I will be in the centre of Melbourne at a wonderful event where seven writers reflect on their love affair with writing. On Saturday I will be performing a sin/poetry/walking monologue in Daylesford, and on Sunday I’ll be sharing a Spanish celebratory lunch and stories at the mighty Pavilion Cafe in the Valley of A Thousand Hills. Maybe come out and join us for some paella, some hills and some air. Ailsa you sound so sad today. Don’t let those negative people bring you down, you have accomplished so such in your life. Your story of walking the Camino has inspired me, and I too will walk it one day, but I will never be able to write about it like you did. Remember the whale plume, I’m so glad you saw it, breathe in, breathe out, keep going. Thanks so much for your reassurance and compliment. I don’t feel sad so much as small, in the face of the Bobs and Annas. I don’t know how they do it, and I keep thinking about how often I have just blurted something negative about someone’s work without thinking of their intention. It’s not that I think we shouldn’t argue – I love a difference of opinion and a heated exchange. But I do think that listening – on all levels – is difficult and not encouraged. So thank you for taking the time to read between lines and listen here, and for the generosity of writing to me. I do keep on seeing that whale plume. And I’m going out into the sunshine! Hope you find some in your day too, and thanks for your kindness. 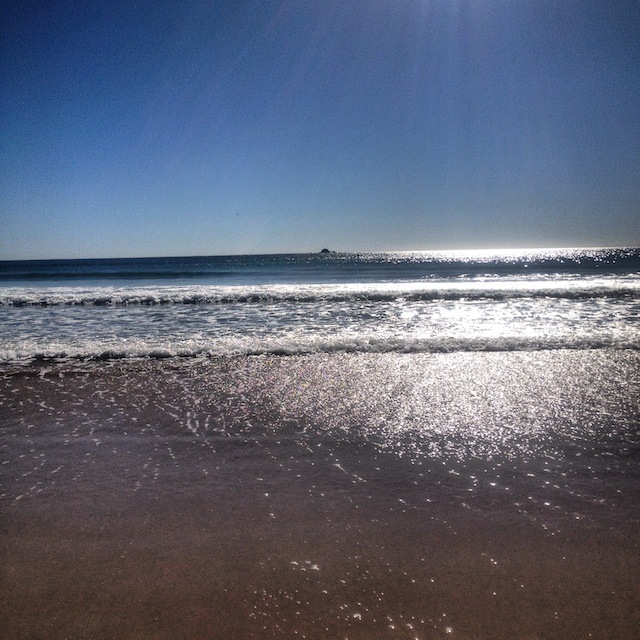 Lots of lovely sunshine in Caloundra QLD today, in fact not a cloud in the sky, it certainly does help to lift your spirit. Are you ready for your breath to be switched off? But what happens when you stop breathing? Thanks Michael. 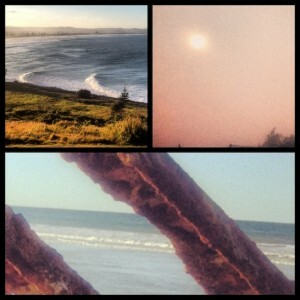 Great notion isn’t it – the possibility of seeing our breath. Maybe then we’d be more aware of each one. But perhaps we need to be able to shut down the awareness in order to function? Great thoughts. Thanks. 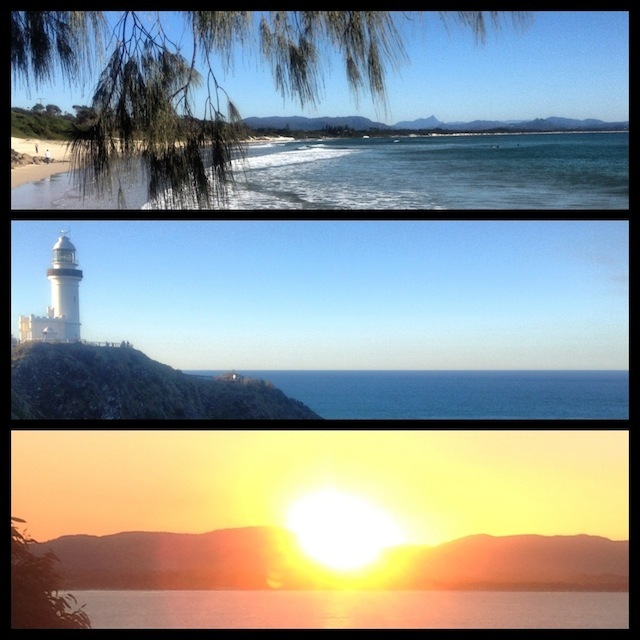 It’s clear you enjoyed the Byron Bay time – like-minded people – interested in writing and reading and thinking philosophically, generously – from experience, observation and reflection. There is a breed of person, nonetheless, from whom negativity, cynicism and rudeness, in truth, erupt – and generally speaking, their identity is NOT revealed – it is anonymous. Perhaps they like to be curmudgeonly – more likely they enjoy inflicting attack (and we might wonder why that is, of course)! You must not take it personally. This morning I walked the Fernleigh Track – some 16 kms of bush corridor from Belmont TAFE to Adamstown Railway Station – a former rail line (passengers/coal trucks) now transformed. About two-and-a-half hours. Whip birds and paperbark swamps – bell-birds and angophoras, temperate rain-forest patches and red-beaked finches – and the vast majority of the path out of site of housing/traffic. People walking, cycling, jogging with baby in pram or dogs on leads. Casual greetings as people pass – keeping to the left! And thoughts of the Shikoku 88-temple pilgrimage not far from my thoughts – of course – as you find in Cape Byron another Finisterre! I took the bus back home and engaged in a conversation with the passenger in front of me when I missed an announcement by our bus-driver (he was running too far ahead of the timetable so had puled over for some minutes)! She has a son in Year 11 at Swansea H.S. where I did a relief day of teaching yesterday – one of my classes a Year 11 English class – studying War Poetry – Siegfried SASSOON among the few we had time to look at – pondering the many who are sent and the few who return whole – others killed, bodies maimed or hearts and souls twisted from what we lucky civilians who have escaped direct war-time experience might think of as normal. The conversation shifted to corporal punishment – my new friend declaring that she was for bringing back the cane. I made mention of my own teaching career and that from some terrible examples of this form of punishment in one of my Sydney schools the principal, a good man, had introduced me to Parents and Teachers Against Violence in Education. That one of its key members, Bob OUTTERSIDE – then the principal of Sydney Boys H.S. – had noted sagely that one beats the Devil, in, not out! Further, PTAVE understood well that such punishment models the kinds of behaviour to those who are younger (as we find in so many other areas of abuse now coming under public scrutiny) that caning – in the past – taught that big people have the right to hit little people. She nodded at this perceptual shift as if it made sense to her. At the same school yesterday in the English staff-room a youngish teacher (40, 41) – given my current 63) with a vaguely North American accent referred affectionately to his “red-neck town” a propos of something else I had said. I asked him where his red-neck town might be. Prince George, central British Columbia. Oh, I had a cousin, I mentioned, now retired to Vernon, but for many years teaching in Prince George. His name I threw into the conversation. But – he was my teacher at PGSS – said my colleague! A good teacher! More small world serendipity! I’m not so sure about the “breed of person” – I think I’m just as capable of careless dismissal as anyone. And of course it is not compulsory to like the book! There will be those who can’t bear it, as there are with any creation. And while this comment was undoubtedly rude and dismissive and cruel, it was not made anonymously, and I admire that. I agree that it is easy to throw out jibes, or to belittle with humour, when done anonymously, but this one was prepared to own up, so no complaint there. I think I was really trying to wrestle with the lack of civility that exists in any kind of public discourse now, and also in much of the social media forums. I was struck by the respectful – yet never po-faced – way that people came to the Byron conversations. But best memory of all is the connection. Which is what I experience here, and through you writing your story of your day, and the conversation that connected dots around the world. Breathing together and being awake to another. Wonderful. Yes, part of the journey – and it’s always in dealing with the challenges that we grow. But there are definitely days when I’d rather not grow!! I think those Olympians, like Bob Brown and Anna Rose, have taken far more than their share of sticks and stones. And so much of it is instant because of social media. People vent all over them without much thought for consequence. Its so easy to tweet or post, when we don’t have to look back at the damage done. We just react and move on. I hope those athletes have good support teams. Like you. For which many many thanks. I was going to compose a wrap up to my friends who did not attend the Byron Writers Fest this year, but you summed it all up so beautifully, I will share it instead. I feel woefully inadequate in the face of your poignant eloquence. How I loved seeing and hearing you on the panel with Hannie and Charlotte and sadly, I missed your session on your “sinning” book, but was told it was amazing. I am a new fan of your writing and will definitely be looking out for your work to engage and inspire. It feels like I have found a new old friend. Thank you so much Julie. It was a remarkable few days, wasn’t it? We were lucky to be there in such company. And that panel you mentioned was a special treat – Hannie and Charlotte inspire me, and the erudite Caroline is a joy, never letting her intellect overshadow her humanity. Thanks for all your kind words. I’m really touched and grateful. Happy reading. If you are like me you will have come home with a swag of books. When you wrote that you were going to share my post, what did you do? My visitor numbers went whoosh yesterday! Thank you for the support. I posted it on my facebook page. Seems I have more literary “friendsters” than I realised. Great news and good for you. In acquainting themselves with you, they are the ultimate winners, of course. Oh Shucks, you are too kind. Now I’m the colour of a beet – my favourite vegetable. Gracias again. Thank goodness for the ABC and Q & A. What a contrast in successive weeks. Shane Gould, Louise Sauvage, David Pocock, and Michael O’Loughlin, with smarmy John Alexander the sports star turned politician. The first 4 were thoughtful, insightful, and principled. They responded to the audience with candour and respect. They listened, thought and responded much as you experienced at Byron. Alexander was shown up when he avoided questions with anecdotes to toe the Liberal party line and support the Dear Leader. And then this weeks performance ! The politics of the TEA party imported into our living rooms. The outraged twitter feeds were a barometer of our disdain. When 70% of our media is controlled by one organisation the dissemination and shaping of information in this country does not serve us well as a democracy. Q & A were we can see and hear responses to ideas and questions by those who purport to represent us and the Writer’s festivals where ideas and imagination are energised are an important fabric in our democracy. Thank goodness also for writers who travel and observe and offer their perspective and their heart. Wish I’d seen it. Michael O’Loughlin was also at Byron, and was wonderful, I’m told. It seems to be the key, doesn’t it? And I know it is hard to do it well all the time, but it does seem the point of such a panel. Thanks for offering your insights and perspective. These exchanges go some way toward offsetting the white noise. And even if we are mostly in rabid agreement, it is important sometimes to know we are not alone. 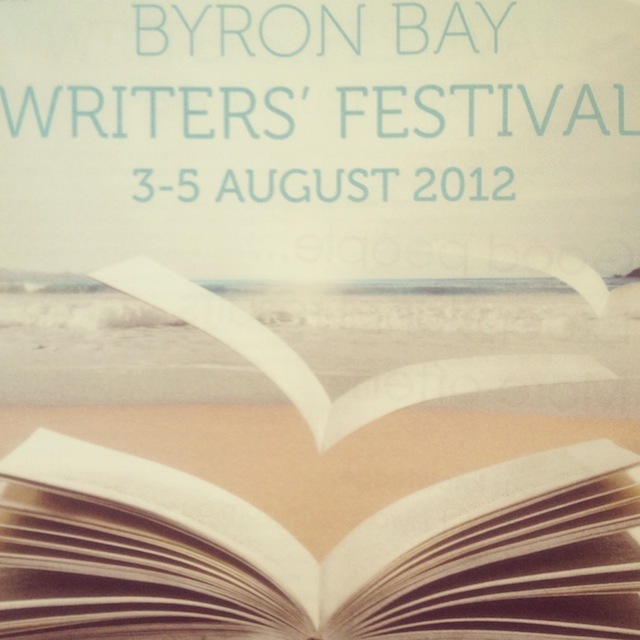 I too have just posted your thoughts about the Byron Bay Writers’ Festival to my web site. How perfect they are. I was going to write something myself, but now I have no need to. By the way, I too have walked the Camino and finished at ‘the end of the earth’ only to realise that my Camino journey had not ended, but had only just begun. I will be doing it again next year. How wonderful of you to stop by. Thank you. I will come over to your site now. It will be another step on a camino of following you. I was there when you read so movingly at the Wheeler’s Debut Monday, and again, watching the Surviving panel at Byron. Thanks for all your stories, and for reminding us of Marie Colvin’s life and death. And “buen camino” for next year. I hope that I will walk one of those Spanish roads sometime in the coming twelve months. All this talking about it makes the heart yearn. Plenty of opportunity for committing sins there, too, like impatience, envy – and gluttony, perhaps. J. Just visited the blog. Glorious, and full of tempters for a frustrated green thumb. Envy at work! Thank you, Ailsa. Speaking of glorious, we are having that weather here in Queensland at the moment, – perfect for plotting and digging outside. privileged to have my memoirs launched there in 2010. Boys Home to Bangalow. I regret not attending your sessions. We used to be neighbours in Prospect St. Surry Hills. Fond regards and I’ll ask for your book from our local library….. I am at a loss here. I thought I had replied to this comment. In fact I know I did. But thanks to Darren commenting on the post, I have gone back and found that I obviously didn’t click SEND. So embarassing, particularly because I was so thrilled to hear from you. I am so sure I composed a long response to you, congratulating you on your book and letting you know that I had just seen Paul up in Sydney. Hope this finds you well and happy up there, and that you have not written me off as rude and unworthy. Write me off as a blonde Luddite instead! I love Bangalow as much as I love Byron Bay. I’m always popping up there to either eat at “Fishheads” or the pub across the street and then go for a walk down the billy cart track to the old Masonic Hall and back. I would love to live there,but my wife won’t move from Brisbane,so it will have to be as an enthusiastic visitor,and not as a resident of Bangalow unfortunately. And another thing Kevin,we named my eldest son Kevin after stopping for lunch in Bangalow on our honeymoon and seeing St.Kevin’s Catholic Church on the hill there. I was thinking of naming my first son Kevin,but that sealed the deal. He’s 21 now,and while I’ve shown him photos of the church,I don’t think he has ever seen it in person. Thanks Darren, for posting this response to Kevin’s comment, and thereby alerting me to the fact that my response had gone into the ether. If your son is anything like the Kevin above, he will be a man of great character and humour and generosity. We were, as he wrote, neighbours for a time, and his house always held the promise of good conversation and a good wine! Everybody needs good ones, as that song says! If you would like to see what I’m are talking about as far as Bangalow goes. Great post Darren. I tried to leave a comment but it may not have worked as I don’t have a Google account and it didn’t want to play. But I love the post, with its coincidences and cross-hatching. ANd I loved seeing St Kevin! Thanks again. “If you would like to see what I’m are talking about as far as Bangalow goes”. I modified that sentence,but accidentally left the word are in,sorry. Just so you know that I wasn’t drunk,hic…when I posted that comment.Hic! I thought maybe you were in pirate mode. Arrrrrr! Glad that 7am tippling is not part of the day!